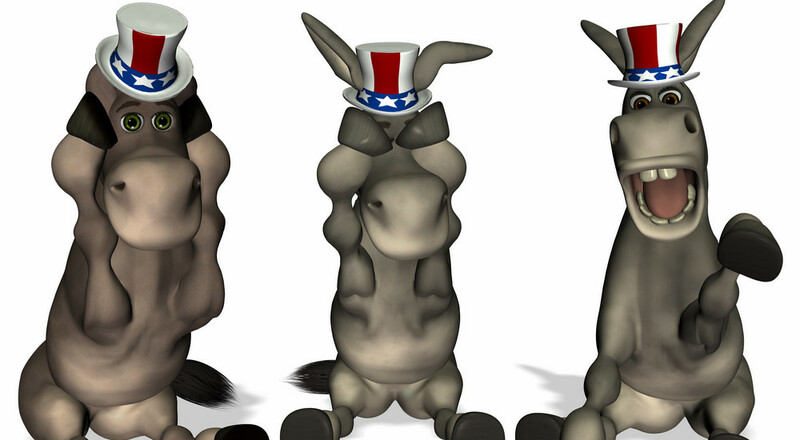 ← America tells Democrats to stick to it up their A$$! That’s not a good question to ask and worse to answer. But there are 9 ways by which the Left can become right. Democrats are demoralized and incensed at losing elections. They have been stripped of power throughout most of the country. Their fear-mongering, hate-filled propaganda is becoming clear to all and turning the good people of America against them. They elected a dictator in Obama who wasn’t Hitler enough for them. Now they are practicing radical fascism provoking, assaulting, rioting, and murdering people to terrorize them into submission and it’s not working. They don’t understand that this is America, by God, and we bow to no one! So some are asking, “How can Democrats be better to win elections?” This is a stupid question (and yes, there are stupid questions and liberals are the ones who ask them). Why would anyone of good heart and sound mind want to make Democrats successful? How do you make a political party that have made themselves the bastion of America’s haters, perverts, and insurrectionists wanting to establish a tyrannical dictatorship over others in order to force their rule upon them a positive? That’s like asking how to make a child molester a decent human being? The Left’s answer is that you don’t, you accept them for what they are as “the new normal.” But that doesn’t work for righteous people. Democrats already elected a wannabe dictator in Obama, but he wasn’t Hitlerian enough for them. Now they want a leader who is more forceful, more destructive, one who will put the Right down, hold them under their iron boot and grind them under the leftist heel, and they are fomenting an insurrection. How can Moslems be better? How can Socialism be better? How can Communism be better? How can Nazism be better? How can criminals be better and succeed in life? How can the Left be better? How can we save the planet from climate change? How can we teach people to be righteous? How can Democrats be better? Become Republicans and join the true unity coalition of people who love America, God, righteousness, truth, justice, and the American Way! Being leftist isn’t about doing what’s right, but about doing what’s easy. The Democrat’s message, that America is evil, only works for America’s enemies. Their platform, that Republican policies kill people and that their people are right to murder Republicans “in self-defense” is righteous, is a platform for criminals and terrorists. Their propaganda that was all geared toward duping people into believing that socialism is beneficial, that man can change the climate of the planet, that CO2 can kill all life, that Islam is peace, is the veil that’s been torn away. Now their propaganda is all geared toward hating Republicans, believing lies, and terrorizing those who will not bow to their will. Instead of re-examining their hate, leftists are wallowing in it to the point that Democrats are now ripe for the rise of the next Hitler. This time, instead of blacks or Jews as their pariah, it will be white Christians. They will make Christians their boogeyman and embrace atheism and Islam in their hate. This is not a party that one should want to teach how to be successful. This is a people who must be kept from power by all means. Christian Republicans are the positive pole in America, while atheist, Islamist, Communist Democrats are the negative pole. You cannot change the poles on a magnet, you can only flip them, and why would anyone want the negative poles of leftist hate and bigotry to rule over what is positive? They can say the Right is the negative all they want, but it only proves they see the world through their looking glass. The solution is not to embrace Democrats, it’s to turn them from evil to which they blindly adhere. America tells Democrats to stick to it up their A$$! This entry was posted in Politics and tagged Atheism, Christianity, Climate change, Democrats, Democrats losing elections, Donald Trump, How Democrats can be better, Islam, Leftist hate, Liberal propaganda, Liberalism, Socialism. Bookmark the permalink.